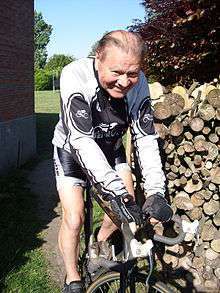 Arthur Decabooter (3 October 1936 – 26 May 2012) was a Belgian professional racing cyclist, active as a professional between 1959 and 1967. Cyclist Walter Godefroot is his wife's brother-in-law. Apart from a few years when he was signed to Libéria-Grammont (1962) and to Solo (1963–1964), he rode for the Groene Leeuw team. His major wins were the 1960 Tour of Flanders and 2 stages and the points classification in the Vuelta a España the same year. Decabooter's other wins include Dwars door België, Omloop Het Volk, Kuurne-Brussel-Kuurne, E3 Prijs Vlaanderen – Harelbeke, and a stage in the Tour of Belgium. ↑ Decabooter kreeg een hartstilstand tijdens een fietstocht. "sporza: Arthur "Tuur" Decabooter (75) is niet meer". Sporza.be. Retrieved 2012-05-26.